2017 marks the 50th anniversary of the 1967 Federal Referendum that was considered by many to be a critical turning point for political change within Indigenous affairs. This Federal Referendum recommended the removal of two clauses within the Australian Constitution that were discriminatory towards Indigenous Australians and, as a result of the political climate of the time, saw the highest YES vote ever recorded, with 90.77 per cent voting for change. For many Aboriginal Australians though, there were unexpected consequences of the yes vote, both positive and negative. This exhibition will present the perspectives of a number of diverse Indigenous artistic communities from across Western Australia who were, in one way or another, significantly affected by the consequences of the yes vote in the 1967 Referendum. Featuring both traditional and contemporary mediums by artists with distinctive and distinguished practices, When the Sky Fell weaves together a range of responses and narrative threads about the historical and ongoing impact of this significant event. The exhibition launches on Saturday 1st July at PICA’s major donor event, the PICA Salon Vernissage. 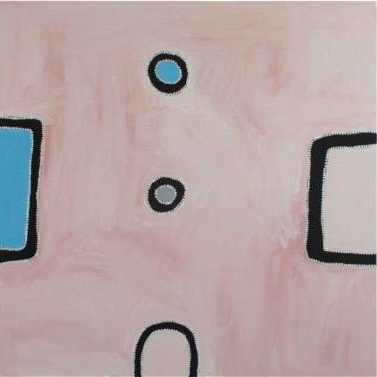 For information about the Vernissage please contact Development Manager Jo Malone philanthropy@pica.org.au or 9228 6300. Born at Victoria Downs Station in 1933, Alan Griffiths worked on pastoral stations in both the Northern Territory and Western Australia, before before marrying and settling at Kununurra. Griffiths began painting his country in the early 1980’s, mapping significant features and the living history of those places. Griffiths is a respected law and culture man dedicated to teaching traditional dance belonging to his traditional country near Timber Creek and for Miriwoong culture in Kununurra. His repertoire of images include paintings that map and name country, reflecting the artists custodial knowledge, as well documentation of traditional stories and corroborrees, cattle mustering and camel treks. Painted in natural ochres and pigments, his narratives are characterized by a series of small figures “dotting” the canvas and are presented as playful, joyous celebrations of life and cultural commitments. Peggy Griffiths learned about culture from observing the lives of the old people in her family. Born in the 1950’s on Newry station, Griffiths saw her old people being taken away in chains at a time in the north of the country when frontier law ruled. Griffith’s connection to country and community was severed when forced station life came to an end after the Referendum, and moving to Kununurra became essential for survival. When she was 16 she married her promised husband Alan Griffiths, and began working at Waringarri Arts in 1985, carving and painting boab nuts and boomerangs. She progressed to painting on canvas and working with limited edition prints, and was the first Indigenous artist to win the prestigious Fremantle Award, in 1995. Griffiths is a renowned dancer and her extensive knowledge of traditional dance forms resonates in her elegant, sinuous imagery on canvas, with the dot work representing the performers body painting. Many Aboriginal people born on pastoral stations were named after the owners or the station name, and Peter Newry was named after the station he was born on in 1939, a 2,500 km pastoral lease bordering the Northern Territory and Western Australian border. Newry lived and worked as a stockman until the removal of his family and himself following the Referendum, but returned to live on country following the outstation movement in the 1980’s. Newry passed away in 2012, but spent the greater part of the preceding decade as a practising visual artist at Waringarri Arts Centre. Newry consistently refined the essence of visual storytelling to the deliberate and sparse mark making present in his work. His grand aerial perspectives narrate the history of his country powerfully but with great sensitivity and a sense of vulnerability. Mignonette Jamin was born roughly around 85 years ago, at Muthanoongamaya, Majalindy Creek, near Palumpa in the Northern Territory and passed away in 2010. As a child and young woman Mignonette walked all over country from Bullo River to Kununurra, but eventually settling at Kununurra when she was around 10 years old. Mignonette painted her traditional country – the rivers, the billabongs, the hills, ridges and roads as well as sites significant for women’s business. Jamin also painted her husband’s country around the Carlton Hill Station area. Jamin’s expressive, confident compositions, filled with a vibrant palette and intimate stories of country reveal the unfettered access the painter had to country despite prevailing government policy at that time. Charmaine Green is a member of the Yamaji Nation of Midwest/Murchison Western Australia. She is a researcher, community advocate and visual artist and poet (Charmaine Papertalk Green) based in Geraldton, Western Australia. Charmaine is a Director of Yamaji Art Centre (Geraldton) and Chairperson of Aboriginal Art Centre Hub WA. Charmaine is an Edith Cowan University Indigenous Studies PhD candidate researching Indigenous Auto-ethnographies. Mervyn Street was born in 1950 at Louisa Downs Station, a large cattle station midway between Fitzroy Crossing and Halls Creek in the Kimberley in Western Australia. Like so many of his contemporaries, Mervyn was a stockman before turning his hand to his art practice. Formerly the Chair of the Kimberley Aboriginal Law and Culture Centre (KALACC) he is now the Chairman of the Mangkaja Arts Resource Agency and an accomplished author, illustrator, carver and painter. Street’s practice focuses on mustering and droving days from the 1940’s and 50’s, cattle stock routes between Broome, Wyndham and on the Canning Stock Route, the first cattle trucks in the Kimberley and campfire stories. Born in 1964 in Derby, John Prince Siddon is the son of Pompey Siddon, who was one of the founding painters at Mangkaja Arts Resource Agency at Fitzroy Crossing in the East Kimberley of Western Australia. 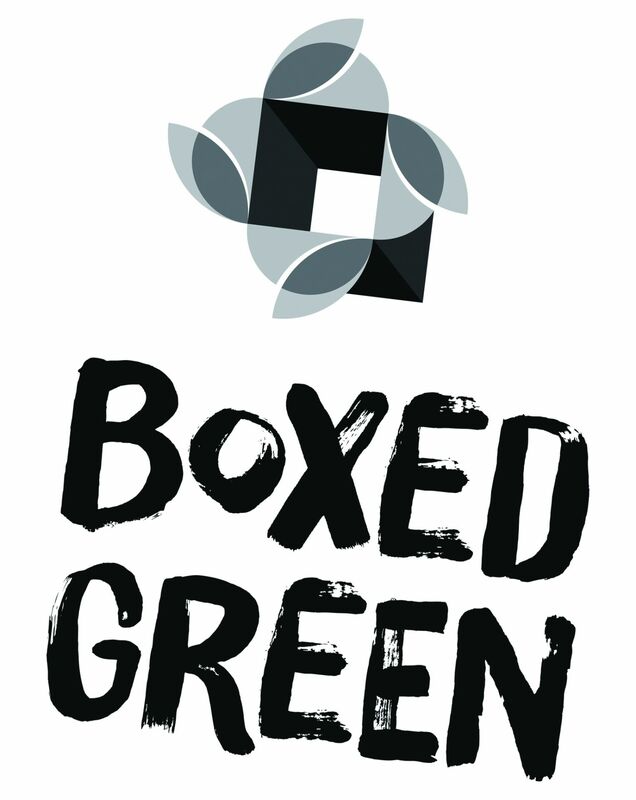 John lives and practices in Fitzroy Crossing, working in a range of diverse mediums including boab nut carving, painting and scratching into enamel on tin objects. Siddon creatively utilises found objects to relate narratives that ‘appear in his head’, particularly addressing a time ‘before kartiya (white men) came’. Sometimes his work features grand narratives of epic battles, animals engaged in life or death struggles and he employs ‘windows’ or visual spaces in his work that direct the viewer to the important subject matter. Freddie Timms was born at a place called Police Hole near Foal Creek on Bedford Downs Station south-west of Warmun (Turkey Creek) in 1945, and he sadly passed away earlier this year. His Gija name was that of his birthplace; Ngarrmaliny. He spent his childhood on Bow River and Lissadell Stations then worked as a stockman, handyman and fencer throughout the east Kimberley. 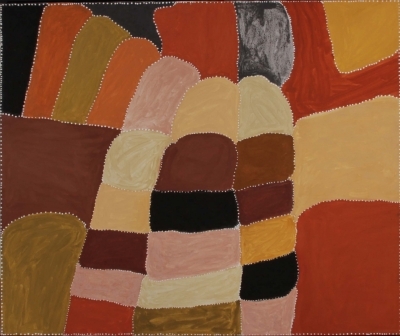 When living at the outstation Frog Hollow in the 1980’s, alongside Rover Thomas, Hector Jandany and his father in law George Mung Mung, Timms began to paint ochres on canvas, developing his own style. Timms then became a key figure in the establishment of Jirrawun Aboriginal Art Corporation, which launched the careers of artists such as Paddy Bedford, Phyllis Thomas and Timmy Timms, amongst others. Timms works are topographical maps of the country and a commentary on the changing nature of his country due to the incursion of colonisation into those spaces. The inimitable Rammey Ramsey was born on Old Greenvale Station in the east Kimberley in 1939. His own country and that of his parents is a part of Gija country in an area to the west of Bedford Downs near Elgee Cliffs, which is where he takes his name Warlawoon, also the name of that area of country. Ramsey walked his country when he was young until he moved to Bedford Downs, subsequently working at Landsdowne Station and eventually moving permanently to Bow River Station. Ramsey began painting for Jirrawun Arts in 2000, evolving the dynamic of his painterly language after observing his great friend Paddy Bedford at work. 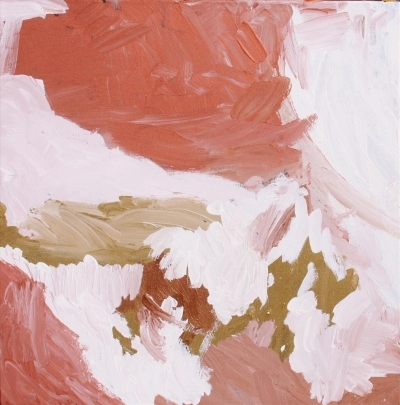 Ramsey commented that he wished to paint the Ngarranggarni way; the mixing of wet in wet of two colours on the canvas that represent the four elements of life – earth, wind, fire and water. 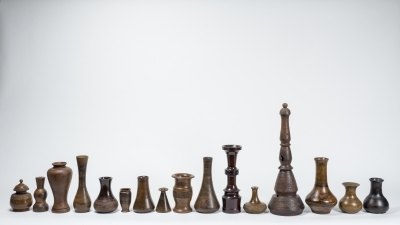 The new stylistic development that Ramsey pioneered is critical in the evolving language of Gija art, centring around history, country and spirituality. Kathy Ramsey is one of an emerging third generation of Warmun artists, who carry on the rich artistic legacy of Gija artists. Ramsey is the daughter of the great yey and Mona Ramsey and the granddaughter of the late Timmy Timms. 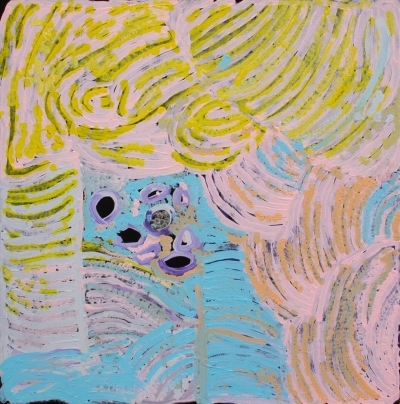 Ramsey was born in 1965 and began painting only four years ago, but her work has already been included in important group exhibitions, in the collections of the Art Gallery of NSW, the Museum and Art Gallery of the Northern Territory, the Art Gallery of WA, the National Gallery, Artbank, the Kerry Stokes and Wesfarmer Collections, and private collections. Recently Kathy was selected as a finalist in the John Fries Award in Sydney and was selected for Revealed in Western Australia. Kathy paints her ancestral country around Bow River, incorporating rich Ngarranggarni stories with recent histories of station life, as well as strong Catholic themes. She continues to paint country and history but with an innovative use of negative space and a strong understanding of compositional narrative. Kathy is also a recognized dancer and keeper of traditional cultural knowledge. Gabriel Nodea was born in 1969 at Derby Regional Hospital. During the early part of his life Nodea moved with his family from Texas Downs Station, to Wyndham, Halls Creek, Noonkanbah and finally to Warmun. 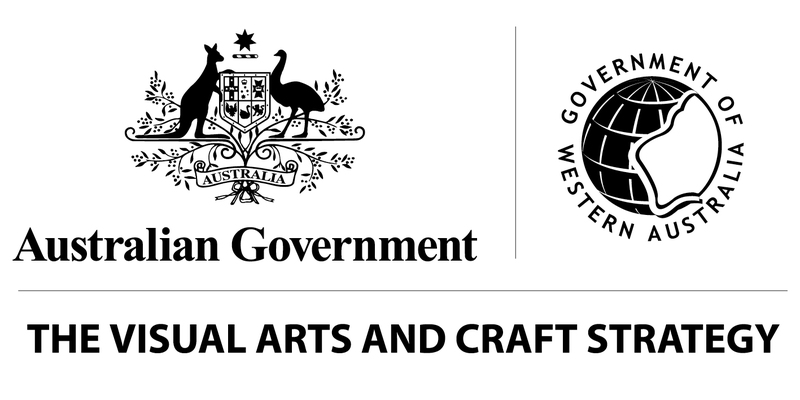 Gabriel was the first student in Warmun to complete Year 10, and began painting in 2004 and in 2010 Nodea was selected to complete the prestigious Wesfarmers Indigenous Arts Leadership program at the National Gallery of Australia. Nodea is a strong Joonba dancer and an important holder of Gija culture and language. 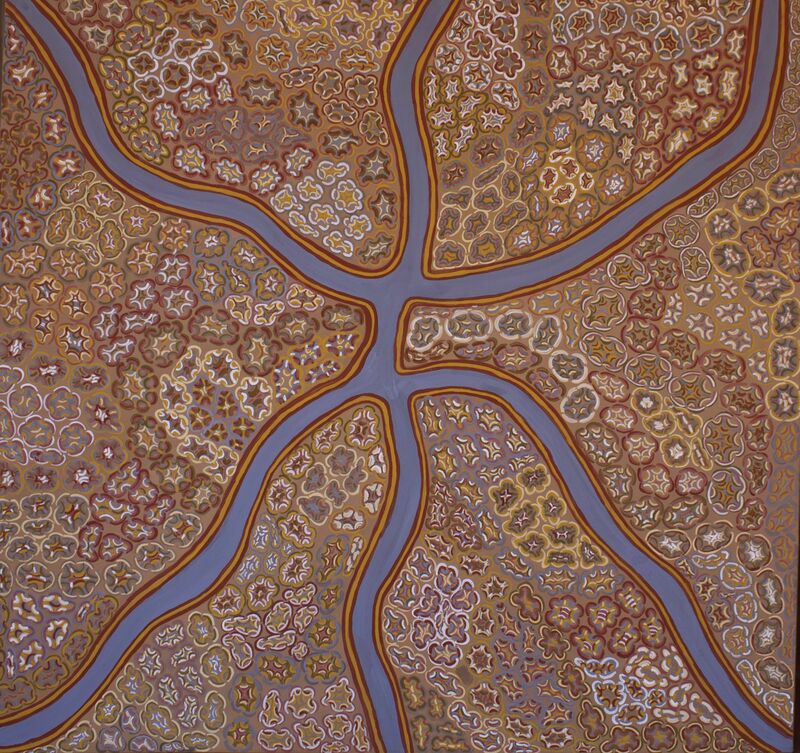 The artist states that he “paints what he dreams; contemporary painting about the Ngarranggarni (Dreaming) in accordance with history of my mother’s people”. 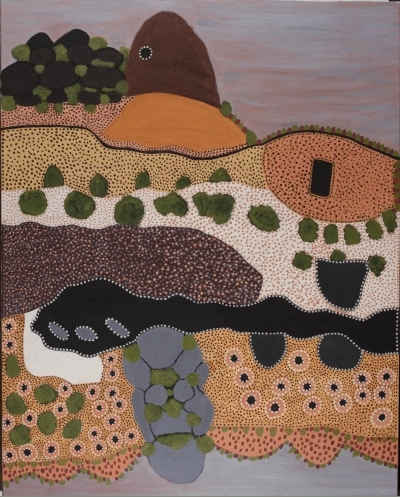 Nodea’s main subject matter includes the locations of Red Butte, Gudparrijal, Ngarrgooroon (Texas Downs country) and the Ngarranggarni and his own dreams. Shirley Purdie is a Gija/Kija artist from Warmun of great significance. 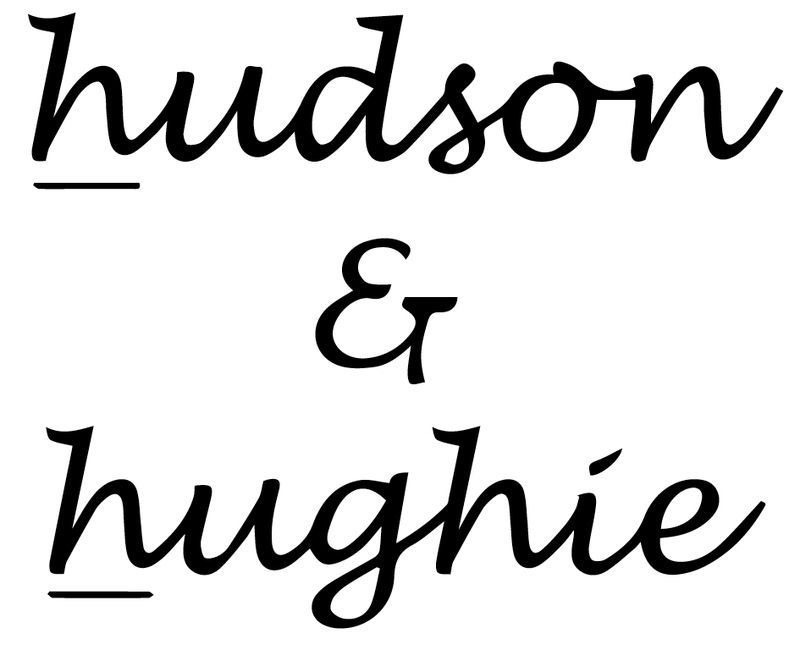 Born in 1947 at Gilban on Mabel Downs Station, Purdie comes from a great tradition of culturally important, internationally renowned painters – her mother being Madigan Thomas and her uncles being Rover Thomas and Jack Britten. 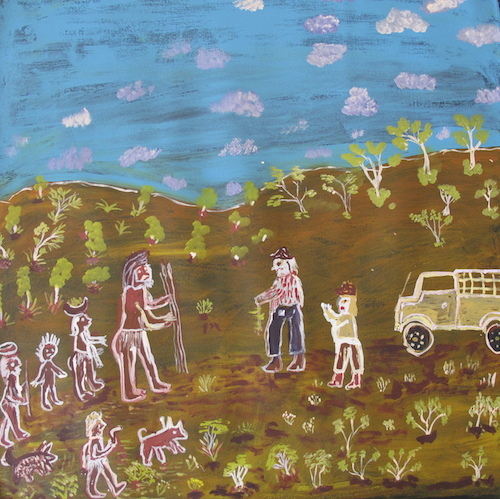 Shirley began to paint her country in the early 1990’s, including significant sites such as Baloowa, Jirragin and Gilban, all taken over by the expansion of the Violet Valley and Mabel Downs cattle stations. Purdie continues to paint country as a way of reconnecting the places Kija people were forced from after the results of the Referendum. 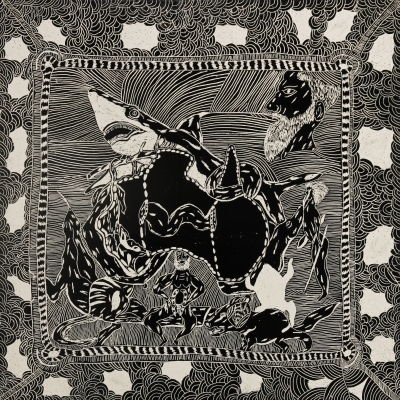 Much of her work explores spirituality and the relationship between Kija conceptions of Ngarranggarni (Dreaming) and Catholicism. Colonial figures of the East Kimberley and accounts of early contact, massacres, warfare and indentured labour since the incursion of pastoralists into Kija land also feature as subject matter. One of the greatest painters of the Warmun and Jirrawun story, Rusty Peters was born in 1934 at Barlinyin – Springvale Station, of Juwurru skin. As a child he learnt traditional law and worked as a stockman and welder, but when is father passed the family moved to Mabel Downs where he became renowned as a horse breaker. Living at Wyndham on Nine Mile Reserve after the introduction of award wages forced people off stations, he then moved to Turkey Creek with other senior Gija artists such as Hector Jandany and George Mung Mung and helped to start the school. In 1989 he moved to Kununurra where he was employed at Waringarri Arts as an assistant and in 1997 he moved to Crocodile Hole with Jirrawun Aboriginal Arts Group, commencing his practice of painting on canvas. His detailed knowledge of country and story from Springvale and Moolabulla stations are reflected in his distinct, challenging style. 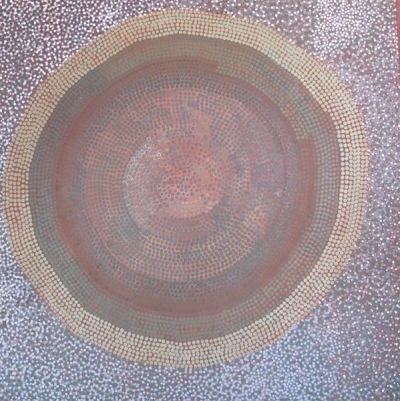 Peters returned to paint at Warmun in 2010 after the closure of Jirrawun Arts. 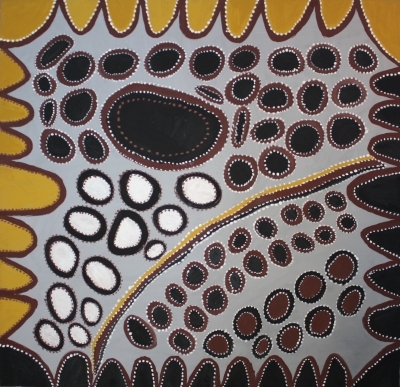 Lindsay Malay is one of a third wave of artists from Warmun who continue the traditions of painting Gija country and history. Born in 1971 at Wyndham, he has been heavily influenced by his Grandfather Sally Malay, who raised children and grandchildren, including Lindsay, on Bedford Downs Station. The artist himself worked as a stockman on the station, before eventually starting a family in Derby. The Malay family were involved in a land claim for a number of years (after being forced off their custodial country in the years following the Referendum) and in 2010 their country Warlawoon was returned from the Yulumbu pastoral lease. 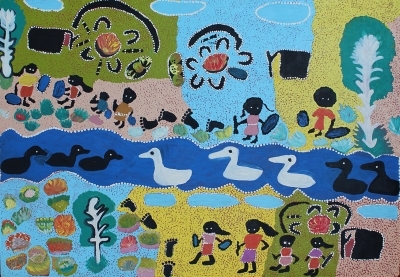 In 2012 after residing in Victoria for some time, Malay began to paint as a way of reconnecting with his country and celebrating what he and his family achieved. Malay now lives and works at Warmun and is also a Studio Assistant. Patrick Mung Mung’s great strength in cross-cultural communication in evident in his art practice. 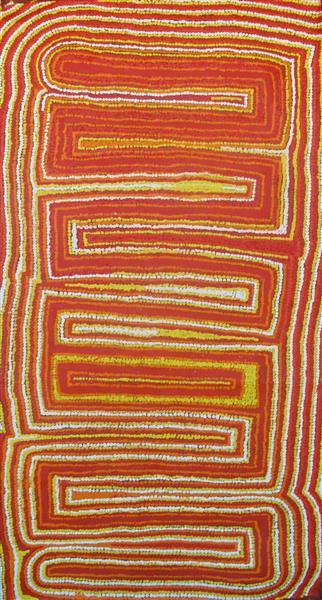 Born the son of George Mung Mung in 1948 at Yunurr (Spring Creek), Mung Mung is a senior artist at Warmun Art Centre. Mung Mung’s work is influenced by the first wave of Warmun artists to gain recognition for their style and narratives. His knowledge of his country and his cultural memory of family, land and work are powerfully linked in his work. Mung Mung worked as a stockman for many years on Texas Downs Station, and was the last worker to leave when it closed down in the 1970’s. 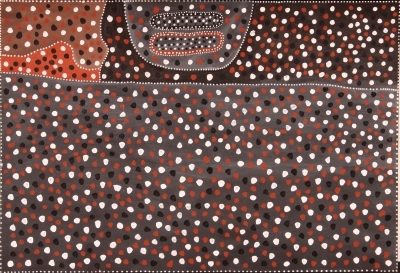 After the passing of his father in 1991, it fell to Mung Mung to accompany his fathers carving ‘Mary of Warmun’ to Canberra for the exhibition Aboriginal Art and Spirituality. This occasion marked the beginning of his artistic practice, as he took on his fathers’ role of senior artist, law and culture man. Mung Mung was instrumental in establishing Warmun Arts in 1998 and continues to paint his preferred subjects of Yunurrel (his birthplace), Jarlarlu (his fathers country), stories about station life, Ngarranggarni stories from Texas Downs and aerial maps of Ngarrgoorroon country. 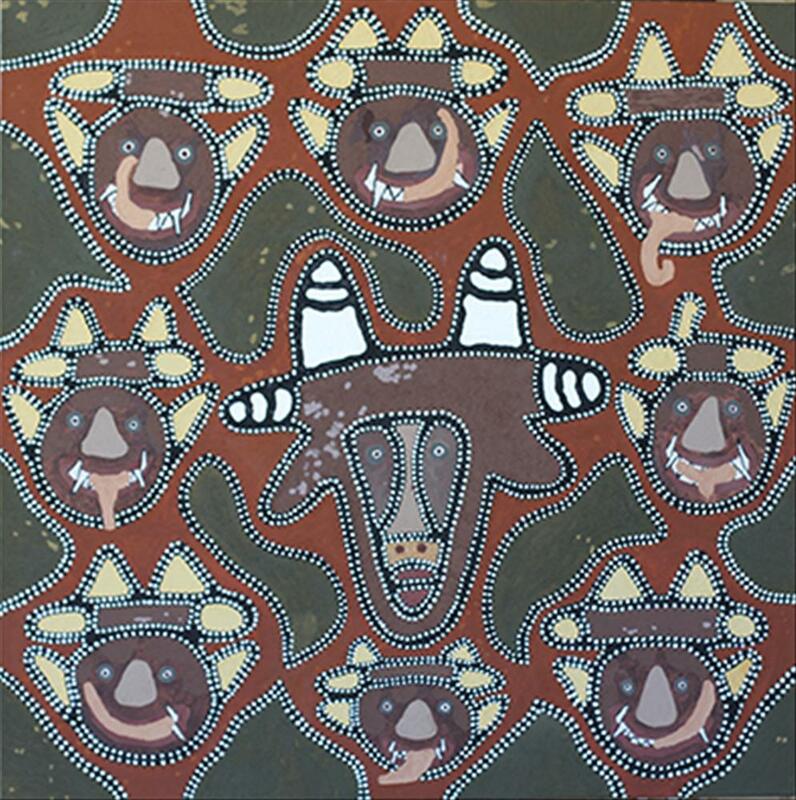 Born in 1951, Jimmy Tchooga is a senior law man painting at Warlayirti Artists at Wirrimanu (Balgo Hills). 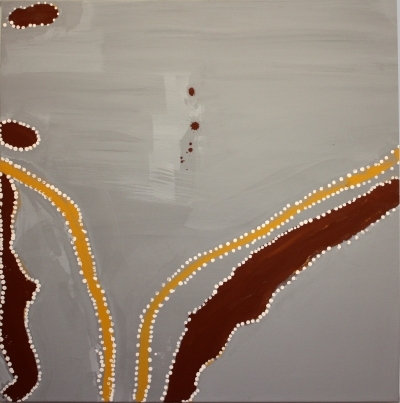 Jimmy’s custodial Country is Tjukukalyu, which lies east of Balgo Hills in the Tanami Desert, and it is this part of this remote location about 280 kilometers south-southeast of Halls Creek along the Tanami Track, and 830 kilometres north-west of Alice Springs that features predominantly in his works on canvas. Jimmy paints in strong hues and the subject of his work is predominantly his father’s creation stories. His work has been shown in Singapore, France and Germany, and in Australia in multiple surveys of Balgo work. Jimmy was previously Chair of the Warlayirti Artists Aboriginal Corporation Board. 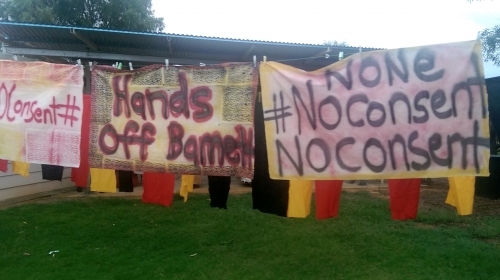 Jeanie Daniels was born in the bush around 1961, and lived a nomadic life during her younger years with her mother Sarah Napanangka Daniels – one of the most senior Law women in Balgo and her father Charlie Tjupurula. Jeanie has been passed down custodianship of her mother’s traditional country called Mina Mina, located north of Lake Mackay in the Northern Territory. Although Jeanie grew up at Mt Doreen Station in the Northern Territory, her family moved between Balgo (Wirrimanu) and Yuendumu (Yurrampi) as her mothers country lay between the two states. Larry Gundora was born in 1950 at the Old Balgo Mission, and is a senior dancer for Law in the region, as well as a respected painter and printmaker. Larry grew up at Wirrimanu and learnt from a young age the location of water sources and how to hunt for bush food. When he was a young boy he attended school at the Old Mission and later worked to help establish the buildings at the new Mission at the current site of Wirrimanu. 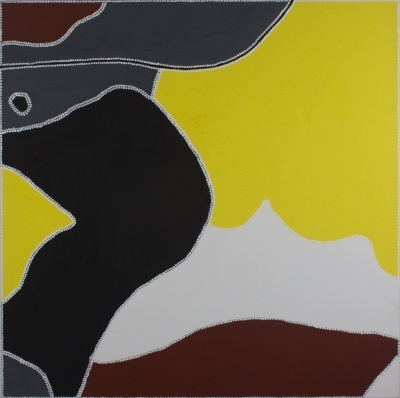 Larry started painting for Warlayirti in 2008 and quickly became known for his confident layering techniques of earth and ochre, and blending them with acrylic colours to build his stories on canvas. His usual subject matter is Luurnpa the Kingfisher, the Old Balgo Mission and the country around Wirrimanu. Eunice Yunurupa Porter was born in 1948 at Wirrkural near Lupul on the Jameson road out of Warburton Mission, and as a child, she and her family walked the country that is today recognised as the communities of Mantamaru, Papulankutja and Irruntju. In the late 1960’s Ngaanyatjarra people living in and around Warburton Mission whose traditional homelands were in the eastern Ngaanyatjarra lands began to move into small settlements closer to their homelands, and Eunice moved to her late husbands country at Warakurna. 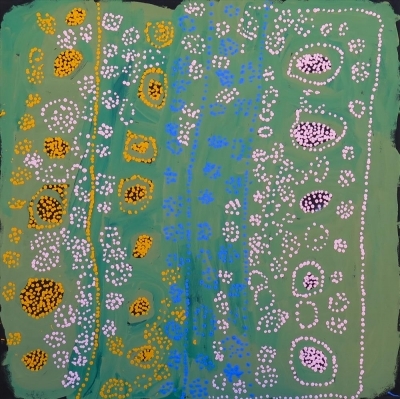 Eunice painted a small number of works for the Warburton Arts Project in the early 1990’s and then began painting with Warakurna Artists in the mid 2000’s. She rapidly became one of its most exciting artists with her vibrant interpretation of Tjukurrpa stories and has been pivotal in the development of ‘history painting’ – depictions of contemporary life in the desert. 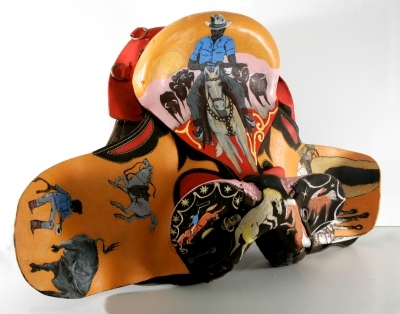 Eunice was a finalist in the 2006, 2009 and 2012 Telstra National Aboriginal and Torres Strait Islander Art Awards and in 2013 was the Western Australian Artist Award winner for the Western Australian Indigenous Art Awards at the Art Gallery of WA. Eunice is a strong community leader and has been the Chairperson the Warakurna Artists Executive since 2006. Manupa was born at Kunangurra near Patjarr community in the Gibson Desert, Western Australia. She came to Warbuton in the 1960’s and spent several years there before returning to her home country. Manupa paints and hunts in the desert and tells stories to her children and grandchildren. Before she moved to Wanarn Aged Care, she divided her time between Patjarr and Warakurna. Now she paints for Warakurna Artists at Wanarn Aged Care as part of the weekly art therapy program they run. Born in 1958 at Mitjika, a rockhole north of the Great Central Road near Warnarn community, Judith Yinyika Chambers attended primary school at Warburton Mission but finished her schooling in Esperance. Her family lived in the camp at Warburton for some time but moved to Docker River along with many other Yarnangu from the eastern Ngaanyatjarra lands. The Golding family – Chambers mothers’ family – were among the first people to move back to Warakurna in the mid 70’s when the settlement was established. Warakurna is Judith’s grandmother’s traditional homeland. Judith has been involved with Warakurna Artists since 2006 and serves as a member of the Warakurna Artists Executive. Her practice encompasses painting, grass and fibre basket and sculpture with Tjanpi Desert Weavers and punu for Maraku Arts. Erica Ikungka Shorty was born in 1959, but little is known about her early life. She has only recently begun painting and lives and works at Warakurna, in Western Australia. Nancy Nyanyarna Jackson’s country is the other side of Karrku near Warakurna in the East Gibson Desert, Western Australia. She painted a limited amount of works for the Warburton Arts Project in the early 1990’s and began painting with Warakurna Artists in mid 2005. She has participated in numerous group exhibitions including the Revealed Program, the National Museum of Australia, Heide Museum of Art and at the Maison des Arts Contemporains in France. Her work can be found in the collection of Artbank and the National Gallery of Victoria, amongst others. Nola Campbell was born in 1948 somewhere between Patjarr and Wiluna, and grew up travelling in the country between Kiwirrkurra and Kunawarritji. She is related to Charlie Wallabi (Walapayi) Tjungurrayi and Nangkatji Josephine Nangala, whom she called mother and father, and her aunt Kumpaya Girgaba. Nola was taken to Warburton as a yong woman, marrying her first husband there, and then went to Wiluna and Patjarr, where she married artist Coiley Campbell. Nola was the subject of an Indigenous Community Stories produced film, titled Nola’s story, which aired during the Fremantle Art Centre’s Revealed Program. Carol Maanyatja Golding was born in 1930 at Walu Rockhole, in between Warakurna and Papulankutja in the East Gibson Desert, Western Australia. As a young child, she walked the tali (sandhill) country between her father’s country in the south near Papulankutja and her mother’s country near Warakurna. She was orphaned at a young age and was taken in by the Hooper family, Rachel Jennings and Eunice Porter’s parents. Carol and her husband had many children and eventually settled in Carol’s mother’s country, Warakurna. Previously Carol had painted with the Warburton Arts Project but began painting with Warakurna Artists in mid 2005 and rapidly became one of the art centre’s leading senior artists. 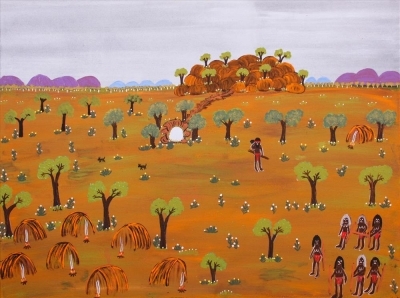 Carol predominantly painted an important Ngaanyatjarra story from her birthing place Walu. Carol passed away peacefully in February 2016 in Wanarn. 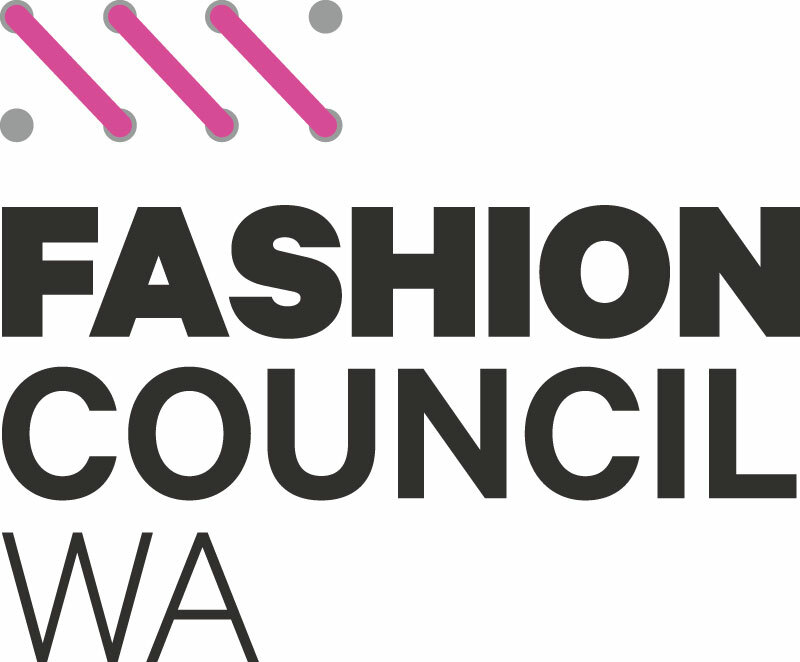 PICA would like to give a huge thanks to Christine Scoggin, CEO, and Charmaine Green, Chair, of the Aboriginal Art Centre Hub WA; exhibition curator Clothilde Bullen, all the artists and the following art centres: Mangkaja Arts Resource Agency; Warakurna Artists; Waringarri Aboriginal Arts; Warlayirti Artists; Warmun Art Centre and Yamaji Art; those that loaned works for the exhibition, including Meredith Bastian, Hugh Briotti, Emilia Galatis, Tom Griffiths, Sophie Lawrence, Jen Lowe, Jane Menzies, Renae Newman, Julienne Penny, Thelma Pye, Helen Read, Emily Rohr, Zoe Roy and Matt Ward; the Department of Culture and the Arts; Wesfarmers Arts; the Metropolitan Redevelopment Authority; Grace; Plastic Sandwich and Dulux. 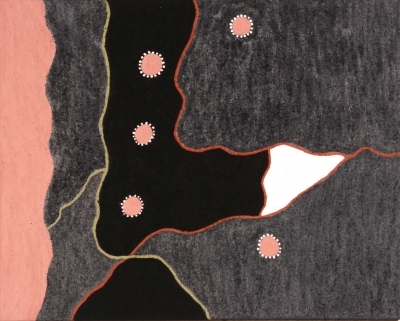 Header Image: Alan Jangala Griffiths, Early Days, 2013, Natural pigment on canvas, 90 x 120 cm. 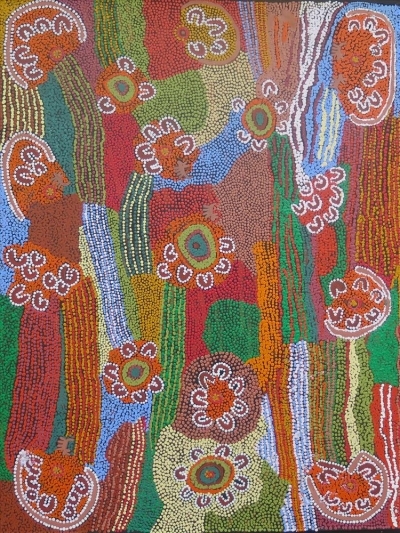 Image courtesy the artist and Waringarri Aboriginal Arts.